Do you think it'll work here? The city of Abu Dhabi has enacted a novel way of informing its motorists they are approaching a speed-limited road: by coloring-coding. 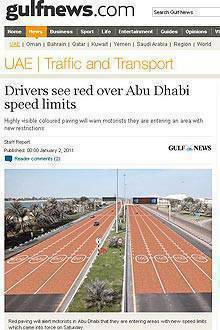 Instead of having to crane their necks to spot the speed limit signs, motorists can simply check the road they're on, GulfNews.com reported. "The drivers can easily identify the red pavement and they must reduce speed before reaching there," Colonel Engineer Hussain Ahmad Al Harithi, director of traffic and patrols at Abu Dhabi Police said in the report. Al Harithi added that the changes were made to enhance the safety and security of motorists in the city after extensive studies of the traffic requirements of the Abu Dhabi emirate in the next decade was concluded. In residential areas in Abu Dhabi, the speed limit is between 20 and 40kph while highways have a speed limit of 140kph. Do you think the Metropolitan Manila Development Authority should start painting the roads in the metropolis?